into upright, fertile axes ~6.0mm in diameter that bear terminal sporangia (FIG. 8.16) with trilete spores (Wellman et al., 2006). There is some suggestion that the apex twisted during the development of the sporangia or that torsion of the sporangium was somehow involved in spore release. 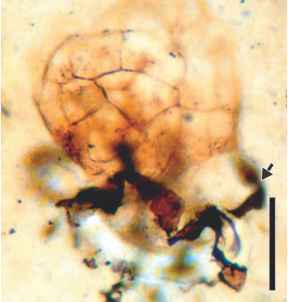 This sporangial feature is also found in the Early Devonian compression genus Tortilicaulis and has been compared with the morphology of certain bryophyte sporangia (Chapter 5). The anatomy of the prostrate and upright axes is simple (FIG. 8.17); most of the axis consists of a parenchymatous cortex (FIG. 8.18), which is subdivided into inner and outer zones. The outer cortex is composed of densely packed elongated cells with narrow intercellular spaces. The cells of the inner cortex are more loosely spaced and exhibit a well-developed intercellular system (FIG. 8.19). The outer cortex is surrounded by hypodermal tissues and epidermis. 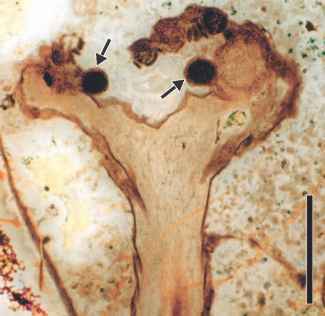 Between the outer and inner cortex, there is a well-defined region of cortical tissue in which an endomycorrhizal fungus, Glomites rhyniensis, forms intracellular arbuscules (Chapter 3). figure 8.17 Cross section of chert block in FIG. 8.10 showing numerous axes (Aglaophyton major) in transverse section (Devonian). Bar = 1 cm. 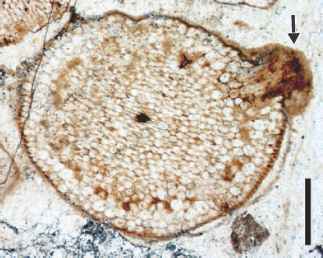 figure 8.18 Transverse section of Aglaophyton major axis showing central strand and dark cell zone (arrow) containing arbus-cules (Devonian). Bar = 650 pm. 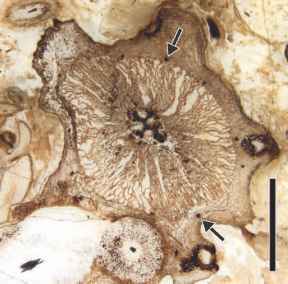 figure 8.19 Transverse section of Aglaophyton major axis showing thin-walled cells of inner cortical zone surrounding central strand (Devonian). Bar = 110pm. thickenings, consisting of a spongy outer layer and inner, delicate decay-resistant component. 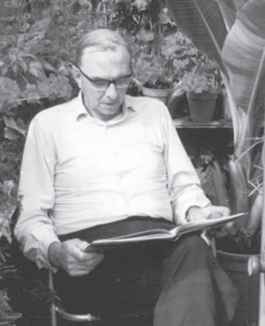 Edwards concluded that the cells of the conducting strand of Aglaophyton are more similar to the leptoids and hydroids found in certain bryophytes than to the sieve cells and tracheids of vascular plants. It is clear from this important work that this plant combines features of both bryophytes and vascular plants, and thus it is placed within an informal group of early land plants, the cooksonioids (rhynio-phytoids), which includes dichotomizing axes for which there is no information about the presence or absence of a conducting strand. 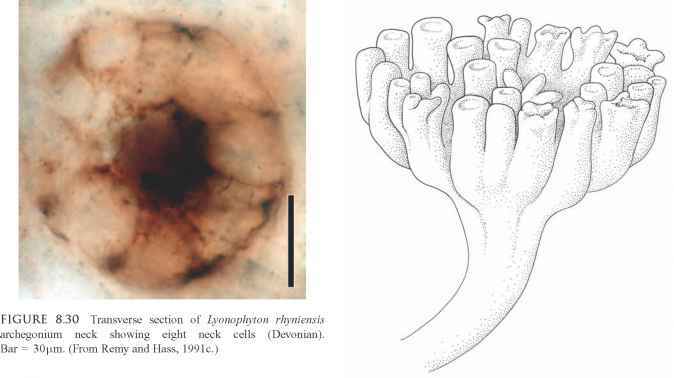 Hass, 1991b), and Horneophyton lignieri-Langiophyton mackiei (FIG. 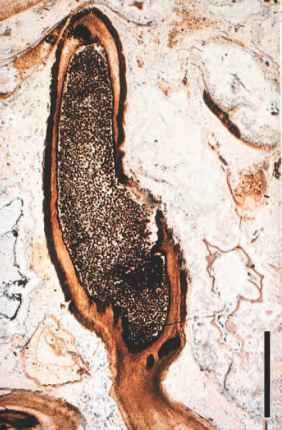 8.32) (Remy and Hass, 1991c), perhaps adding support to the hypothesis that the Aglaophyton-Lyonophyton gametangiophores (FIG. 8.33) were unisexual. 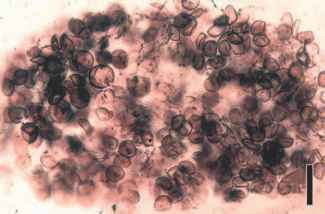 All of the Rhyme chert gametophytes contain conducting cells (FIG. 8.34) and are mycorrhizal (see below). 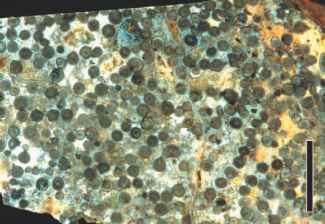 figure 8.31 Spore ball in Rhyme chert (Devonian). Bar = 1 mm. axes and various types of fragmentation suggest that these plants were clonal and possessed multiple reproductive strategies. The environment in which they lived has been reconstructed as a freshwater ecosystem with volcanic influence including hot springs (Trewin et al., 2003). Thus, it seems likely that the various forms of asexual reproduction may have allowed rapid colonization in a variable environment. figure 8.35 Diagrammatic population of Aglaophyton major plants showing single individual (yellow box), association of plants by endomycorrhizae (brown filament), and fragmentation (red lines). figure 8.37 Detail of Rhynia gwynne-vaughanii axis showing histologic differences in cells (Devonian). Bar = 125 pm. same complement of tissues as the aerial axes. On the tips of some aerial axes are ellipsoidal, thick-walled sporangia up to 3.0 mm long. The sporangial wall is constructed of a zone of outer palisade cells with thickened lateral walls termed a cohesion tissue. Rhynia gwynne-vaughanii was homosporous and produced spores in tetrahedral tetrads; each spore is ~40 pm in diameter and ornamented by closely spaced spines. The gametophyte phase is called Remyophyton delicatum (Kerp et al., 2004) and consists of a dense cluster of >200 unbranched axes, 0.2-0.7mm in diameter (FIG. 8.38), with the basal region represented by globular prothalli (protocorms) bearing rhizoids. 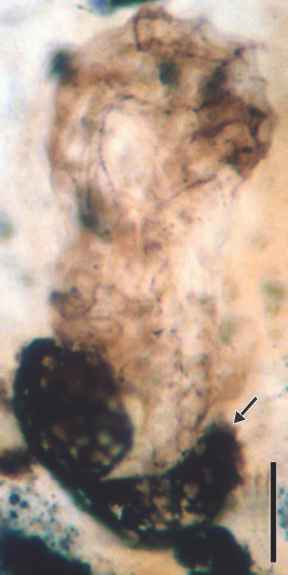 Gametophytes are unisexual—either archegoni-ophores or antheridiophores. 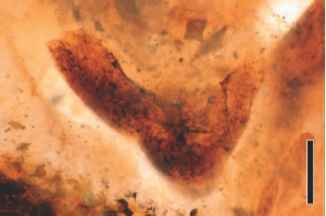 Archegoniophores are larger (10-15 mm long) and bear massive archegonia with long protruding necks. Antheridiophores are smaller (4-8 mm long), with stalked antheridia arising from the flattened upper surface. Conducting tissue is made up of S-type elements. A globular mass slightly larger than the gametophyte axis has been described extending from the archegonium in one specimen and this has been interpreted as a putative sporophyte (Kerp et al., 2004). 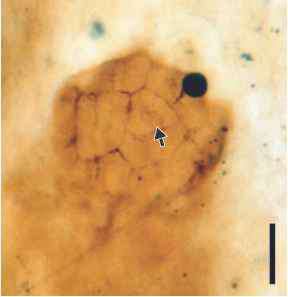 figure 8.39 Rhynia gwynne-vaughanii showing possible early stage of adventitious branch (arrow) (Devonian). Bar = 650 pm. of the adventitious branches, Edwards was able to show that R. gwynne-vaughanii was more monopodial in growth architecture than Aglaophyton. In addition, he suggested that sporangia abscised after the release of spores, and in some instances, new branches formed distal to the abscission zone (Edwards, 1980). This plant was originally described by Kidston and Lang (1920a) as Hornea, a name that was previously occupied by a flowering plant. Some features of Horneophyton lignieri are of special interest because they differ from those of other Rhynie chert plants. The plant consists of naked and dichot-omously branched aerial axes (FIG. 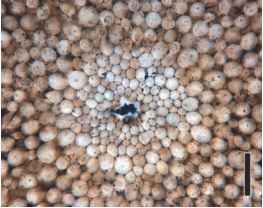 8.40) up to 20 cm high and 2.0 mm in diameter, which are attached to a lobed, corm-like structure that bears numerous rhizoids on the lower surface. Although the structural features of the aerial axes are similar to those of Rhynia, with a central conducting strand, the basal corm lacks any evidence of vascularization. Recent studies indicate that in the basipetal regions of the aerial stem the phloem cells become indistinct, with conducting elements losing their characteristic features in more basal sections. At the transition between stem and corm, opaque parenchyma cells replace the conducting elements and these are distinguishable in the corm proper. dehiscence took place through an apical pore. Extending into the sporangial cavity is a central column of sterile tissue around which a continuous zone of sporogenous tissue, or spores, developed. 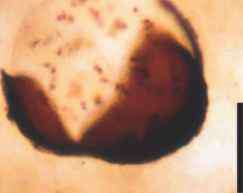 Both isobilateral and tetrahedral tetrads of spores occur in Horneophyton sporangia (Sharma and Bohra, 1985). 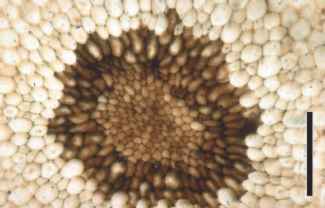 The spores (see Wellman et al., 2004 for details) are radial, trilete, and irregularly ornamented by cavities that may represent some type of exine degradation. They range from 39-49pm in diameter and are most similar to the sporae dis-persae taxon Emphanisporites decoratus (Wellman et al., 2004). Some have been described as containing multicellular gametophytes (Bhutta, 1973). The plant is believed to have been homosporous. 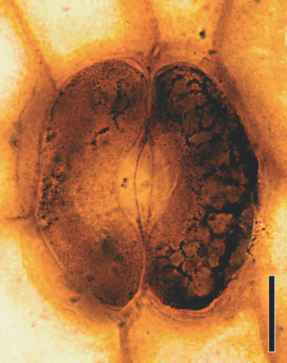 The gametophytes are described under the generic name Langiophyton mackiei (Fig. 8.32) (see below). The sporangium in Horneophyton is unique among plants, both living and fossil, in that it consists of a branched fertile unit of four lobes that resulted from dichotomies of the stem apex (Eggert, 1974). Consequently, each fertile lobe was produced by its own apex, and these apices must have remained meristematic for a short time, as spores within the sporangium show evidence of acropetal maturation. The lobed Horneophyton sporangium also has been interpreted as transitional, leading to a synangium in which some differentiation and partitioning of sporogenous tissue took place. 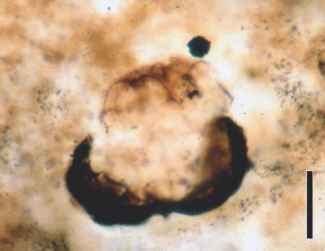 The most complex element in the Rhyme chert flora is Asteroxylon mackiei. 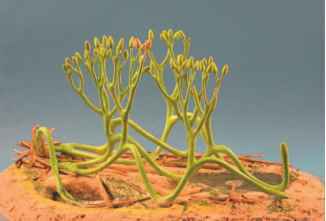 It is a particularly interesting plant that is sometimes included in the Drepanophycales (Chapter 9), although it lacks true leaves. Unlike the other Rhynie taxa, A. mackiei is characterized by numerous small flaps of tissue (leaflike appendages or enations) that cover the aerial stems, as well as a more complex central strand and conducting system. 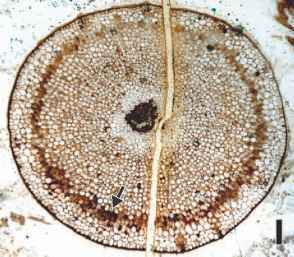 Asteroxylon mackiei was homosporous like the other Rhynie chert plants, but the sporangia were located laterally along the stem, not apically, as in the other taxa. In the original description of this plant, Kidston and Lang (1920b) described narrow and naked distal branches with terminal sporangia that, although not actually attached, were thought to be the fertile portion of the plant. The presumed terminal position of sporangia in A. mackiei was considered to be evidence that all the Rhynie plants were closely related. 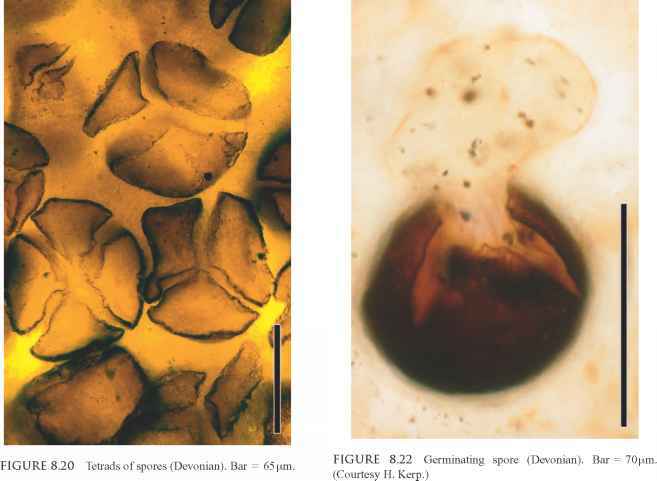 Subsequent studies of chert blocks containing A. mackiei axes, however, indicate that the sporangia were borne laterally on the stems, near the axils of leaflike appendages, instead of in a terminal position (Lyon, 1964). This important discovery greatly altered the taxonomic position of the genus. 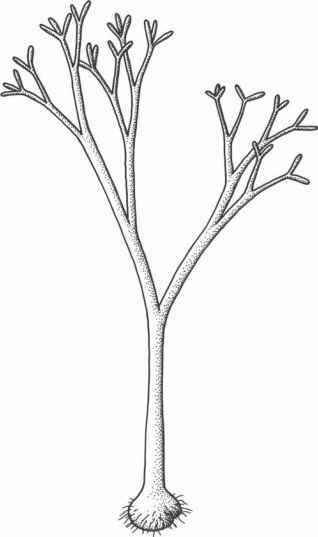 Asteroxylon mackiei was probably up to 50.0 cm tall and consisted of upright, monopodial axes supported by a horizontal, subterranean rhizome (Fig. 8.41), which may be up to 4.2 mm in diameter (Kidston and Lang, 1920b) . From the principal aerial branches arose secondary branches that were regularly dichotomous. In contrast to other Rhynie plants, the aerial stems of Asteroxylon were densely covered by numerous leaflike flaps of tissue, each up to 5.0mm long, and the taxon is known from compressions (Fig. 8.41) as well. These structures have been called leaves, scalelike leaves, leaflike scales or appendages, or enations. They are not true leaves (Chapter 7), as they contain no vascular tissue and are not produced in a regular pattern (phyllotaxy) from nodes, as true leaves are. The enations in Asteroxylon have been hypothesized to represent the precursors to microphylls, the leaf type which is unique to the Lycophyta (see Chapter 9 for a discussion). It is not certain that stomata present on the stems also existed on the enations. figure 8.41 Suggested reconstruction of Asteroxylon mackiei (Devonian). figure 8.42 Cross section of Asteroxylon mackiei stele (Devonian). Bar = 1mm. 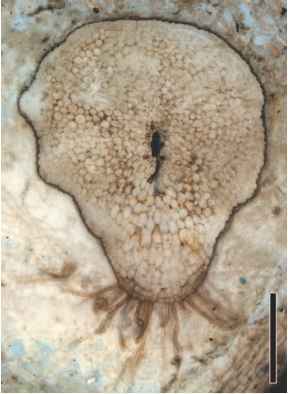 figure 8.43 Transverse section of Asteroxylon mackiei showing actinostele and highly lacunate cortex characteristic of mature axes. Arrows indicate several traces in the cortex (Devonian). Bar = 4 mm. 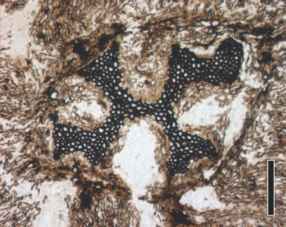 In the rhizomatous portion of Asteroxylon the conducting strand has a central core of thick-walled elements, while the strand is stellate or star shaped in cross section in the aerial axes (Fig. 8.42), the feature from which the generic name is derived. The stele of Asteroxylon has been interpreted as an Asteroxylon-type protostele (Ogura, 1972) or an actinostele. 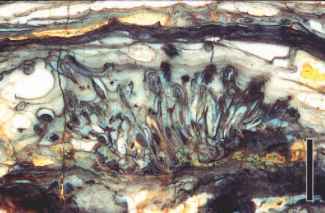 Primary xylem is slightly mesarch, with the protoxylem elements situated near the edges of the xylem ridges. Xylem elements have annular and helical secondary thickenings. Thin-walled cells in the furrows between the xylem ridges are thought to represent phloem. 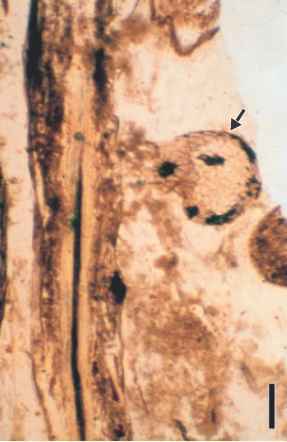 In a transverse section of an aerial axis, numerous small strands of vascular tissue can be seen in the cortex (FIG. 8.43). These traces originate at the outer edges of the xylem ridges and extend through the cortex, ending abruptly near the periphery of the stem at the bases of the enations; they do not pass into the enations themselves. 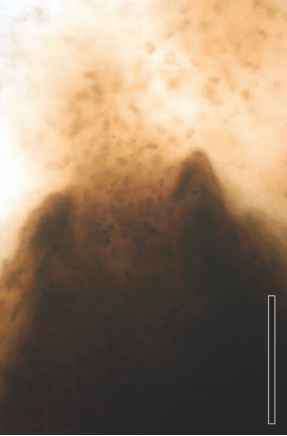 Reniform sporangia, with dehiscence along the distal edge, are produced on short, vascularized pedicels scattered among the enations, apparently in no particular relation to the enations themselves. Sporangia are up to 7.0 mm long; spores are 40-60 pm in diameter and ornamented by closely spaced spines on the distal surface. N. aphylla plant consists of an aerial system of upright, dichotomously branching axes that arise from subterranean rhizomes <2.5 mm in diameter (FIG. 8.44); the entire plant was <20 cm tall (Kerp et al., 2001). The aerial axes are covered by slightly elongated emergences (FIG. 8.45), each of which bears a single stoma. While the aerial axis is anatomically similar to that of other Rhynie chert plants, the anatomy of the prostrate rhizome is unique. In cross section, the rhizome is bilaterally symmetrical with a median ridge (rhiz-oidal ridge) that extends the length of the axis on the lower surface; extending from the ridge are unicellular rhizoids up to 1.5 mm long (Fig. 8.44). The rhizome anatomy includes a central stele with a strand of fibrous conducting cells surrounded by a narrow zone of phloem-like tissue. Outside the phloem is a parenchymatous cortex, hypodermal tissues, and epidermis. The internal anatomy of the ventral rhizoidal ridge includes a rhizoid-bearing epidermis, several hypodermal layers of relatively large and radially arranged cells, files of thin-walled parenchymatous cells that connect to the stelar body, and individual, extrastelar conducting elements (xylematic elements of Kerp et al., 2001). Sporangial position in N. aphylla is highly variable, with individual sporangia borne on adaxially recurved stalks whose attachment may range from helical to almost whorled. Sporangia are reniform (3.0mm wide by 2.0mm long) with dehiscence through a long, apical transverse slit; spores are radial (65 pm) and trilete. The gameto-phytes are assigned to Kidstonophyton discoides and are unisexual (Remy and Hass, 1991b). Like many, and perhaps all of the Rhynie chert plants, N. aphylla is highly clonal, with numerous plantlets borne on the rhizomes (Daviero-Gomez et al., 2005). 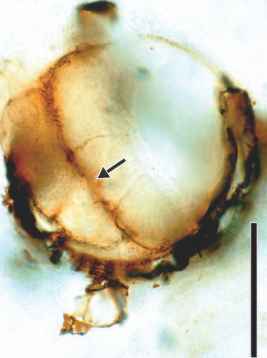 These appear as lateral buds on the rhizome, and in sections of the chert in which the plants are preserved, it is possible to see several levels of rhizomes in section view. In certain anatomical features, N. aphylla may be compared with members of the old Rhyniophyta, whereas the laterally borne, stalked, reni-form sporangia are features that suggest affinities with the Zosterophyllophyta. This plant from the Rhynie chert is very rare. The aerial axes are up to 2.5 mm in diameter, branch dichotomously and pseudomonopodially, and exhibit circinate vernation. They are covered with small, unicellular spinelike projections. The central strand has exarch maturation with annular-helical secondary wall thickenings on the conducting elements (Lyon and Edwards, 1991) (FIG. 8.46 ) . Sporangia are reni-form and attached laterally to the axes by a small stalk, characters which identify T. teuchansii as a zosterophyll. The sporangia also bore unicellular spines and produced smooth, trilete spores. spore-producing structure, such as a strobilus. 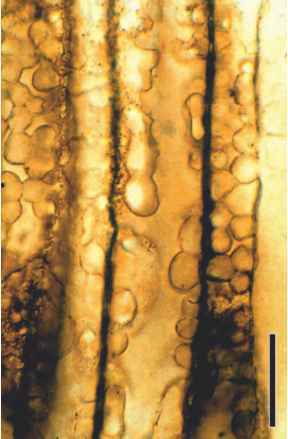 The wall of the sporangium is multilayered and trilete spores <75 um in diameter were produced by this homosporous plant. The shape and position of the sporangia and the coiled apices suggest that V lyonii is a zosterophyll. Fayers and Trewin (2004) describe Ventarura growing in association with Asteroxylon and Nothia and suggest that this plant community colonized organic-rich, sandy substrates. 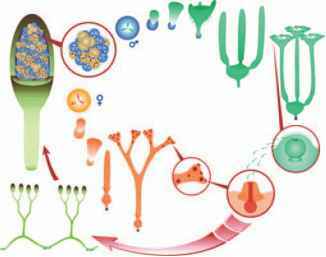 To date nothing is known about the gametophyte generation of either Trichopherophyton or Ventarura. HOW THE PLANT FOSSIL COLORING?